^ Reville, F. Douglas. "History of the County of Brant: Illustrated With Fifty Half-Tones Taken From Miniatures And Photographs." Brantford Historical Society, Hurley Printing,Brantford, Ontario, 1920, p. 319. Retrieved from Brantford.Library.on.ca, May 4, 2012. ^ Bell, Mabel. "Twenty-Five Years Ago: Dr. Bell's Telephone Service (letter, dated August 24, 1922)." Bell Telephone Quarterly, Vol. 1, No. 3, October 1922, reprinted in Bell Telephone Magazine, Autumn 1947, p. 174. ^ "Time Line of Alexander Graham Bell." memory.loc.goiv. Retrieved: July 28, 2010. ^ "Call me Alexander Graham Bell." fi.edu. Retrieved: July 28, 2010. ^ "A History of Electrical Engineering." ieee.cincinnati.fuse.net. Retrieved: December 29, 2009. ^ Fitzgerald, Brian. 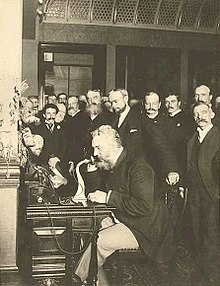 "Alexander Graham Bell: The BU Years." B.U. Bridge, Vol. V, No. 5, 14 September 2001. Retrieved: 28 March 2010. 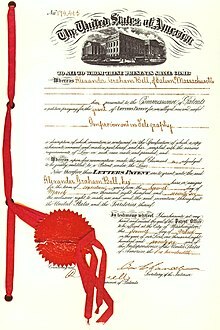 ^ US 174465 Alexander Graham Bell: "Improvement in Telegraphy" filed on February 14, 1876, granted on March 7, 1876. ^ "Bell's Lab notebook I, pp. 40–41 (image 22)." loc.gov. Retrieved: July 28, 2010. ^ "Mr. Wilbur confesses." The Washington Post, May 22, 1886, p. 1. ^ "Phone to Pacific From the Atlantic". The New York Times, January 26, 1915. Retrieved: July 21, 2007. ^ Australasian Telephone Collecting Society. "Who Really Invented The Telephone?" ATCS, Moorebank, NSW, Australia. Retrieved from telephonecollecting.org on April 22, 2011. ^ "U.S. Supreme Court: U S v. AMERICAN BELL TEL CO, 167 U.S. 224 (1897)." caselaw.lp. Retrieved: July 28, 2010. ^ "United states V. American Bell Telephone Co., 128 U.S. 315 (1888)." supreme.justia.com. Retrieved: July 28, 2010. ^ Basilio Catania 2002 "The United States Government vs. Alexander Graham Bell. An important acknowledgment for Antonio Meucci." Bulletin of Science Technology Society, 22, 2002, pp. 426–442. Retrieved: December 29, 2009. ^ Catania, Basilio "Antonio Meucci – Questions and Answers: What did Meucci to bring his invention to the public?" Chezbasilio.it. Retrieved: July 8, 2009. ^ "History of ADT Security." ADT.com website. Retrieved: July 8, 2009. ^ "Antonio Meucci." inventors.about.com. Retrieved: December 29, 2009. ^ "Mrs. A.G. Bell Dies. Inspired Telephone. Deaf Girl's Romance With Distinguished Inventor Was Due to Her Affliction." New York Times, January 4, 1923. ^ "Dr. Gilbert H. Grosvenor Dies; Head of National Geographic, 90; Editor of Magazine 55 Years Introduced Photos, Increased Circulation to 4.5 million." New York Times, February 5, 1966. ^ "Mrs. Gilbert Grosvenor Dead; Joined in Geographic's Treks; Married Professor's Son." New York Times, December 27, 1964. ^ "Mrs. David Fairchild, 82, Dead; Daughter of Bell, Phone Inventor." New York Times, September 25, 1962. ^ Jones, Newell. "First 'Radio' Built by San Diego Resident Partner of Inventor of Telephone: Keeps Notebook of Experiences With Bell." San Diego Evening Tribune, July 31, 1937. Retrieved from the University of San Diego History Department website, November 26, 2009. ^ Groth, Mike. "Photophones Revisted." Amateur Radio magazine, Wireless Institute of Australia, Melbourne, April 1987, pp. 12–17 and May 1987, pp. 13–17. ^ Phillipson, Donald J.C., and Laura Neilson. "Bell, Alexander Graham." The Canadian Encyclopedia online. Retrieved: August 6, 2009. ^ Morgan, Tim J. "The Fiber Optic Backbone". University of North Texas, 2011. ^ Miller, Stewart E. "Lightwaves and Telecommunication". American Scientist, Sigma Xi, The Scientific Research Society, Vol. 72, No. 1, January-February 1984, pp. 66-71. ^ Technical Gazette, New South Wales, 1924, p. 46. ^ "Nova Scotia's Electric Scrapbook." ns1763.ca. Retrieved: December 29, 2009. ^ Gillis, Rannie. "Mabel Bell Was A Focal Figure In The First Flight of the Silver Dart." Cape Breton Post, September 29, 2008. 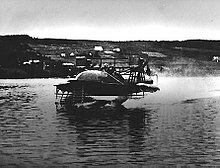 Retrieved from "First Airplane Flight In Canada." ns1763.ca, April 2, 2010. Retrieved: June 12, 2010. ^ "Selfridge Aerodrome Sails Steadily for 319 feet (97m)." Washington Post May 13, 1908. 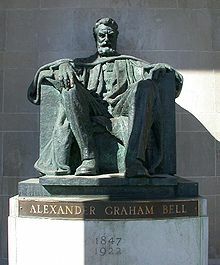 ^ Bell, Alexander Graham. "Memoir upon the formation of a deaf variety of the human race." Alexander Graham Bell Association for the Deaf, 1883. ^ Duffy, Andrew. "The Silver Dart sputtered into history." The Ottawa Citizen, February 23, 2009. ^ a b c d e "Obituary: Dr. Bell, Inventor of Telephone, Dies: Sudden End, Due to Anemia, Comes in Seventy-Sixth Year at His Nova Scotia Home: Notables Pay Him Tribute." The New York Times, August 3, 1922. Retrieved: March 3, 2009. ^ a b Osborne, Harold S. "Biographical Memoir of Alexander Gramam Bell." National Academy of Sciences: Biographical Memoirs, Vol. XXIII, 1847–1922, presented to the Academy at its 1943 annual meeting. ^ "Descendants of Alexander Melville Bell - Three Generations". Bell Telephone Company of Canada Historical Collection and Company Library (undated), from the Brant Historical Society, June 2012. ^ Ireland, Carolyn. "The Portrait Studio House". The Globe and Mail, 27 February 2009. ^ "Daughter Unveils Inventor's Statue: Bronze Figure Is Dedicated By Phone Pioneers". Brantford Expositor, 18 June 1949. ^ "Alexander Graham Bell Family Papers." Library of Congress. ^ Crosland, Maurice P. "Science Under Control: The French Academy of Sciences, 1795–1914". Cambridge University Press, 1992. As cited by James Love in "KEI Issues Report on Selected Innovation Prizes and Reward Programs: The Volta Prize For Electricity." Knowledge Ecology International, March 20, 2008, p. 16. Retrieved: January 5, 2010. ^ Davis. John L. "Artisans and savants: The Role of the Academy of Sciences in the Process of Electrical Innovation in France, 1850–1880." Annals of Science, Volume 55, Issue 3, July 1998, p. 301. Retrieved from InformaWorld.com, January 5, 2010. ^ "Honors to Professor Bell." Boston Daily Evening Traveller, September 1, 1880, Library of Congress, Alexander Graham Bell Family Papers. Retrieved: April 5, 2009. ^ "Letter from Mabel Hubbard Bell, February 27, 1880." Library of Congress, Alexander Graham Bell Family Papers. Retrieved: April 5, 2009. Note (N.B. ): The last line of the typed note refers to the future disposition of award funds: "... and thus the matter lay till the paper turned up. He intends putting the full amount into his Laboratory and Library". ^ "Alexander Graham Bell." IEEE Global History Network. Retrieved: August 8, 2011. ^ "Alexander Graham Bell Family Papers: Home." Memory.loc.gov. Retrieved: February 14, 2012. ^ "Alexander Graham Bell National Historic Site." Parks Canada. Retrieved: February 14, 2012. ^ "Decibel." sfu.ca. Retrieved: July 28, 2010. ^ "Definition: 'bel'." freedictionary.com, American Heritage Dictionary of the English Language by Houghton Mifflin Company, Fourth Edition, 2000. Retrieved: September 2, 2009. ^ Scott's United States Stamp catalogue. ^ "Royal Bank Commemorative Notes." Rampant Scotland. Retrieved: October 14, 2008. ^ "100th Anniversary of Flight in Canada." Royal Canadian Mint. Retrieved: June 12, 2010. ^ "100 great British heroes." BBC News World Edition, August 21, 2002. Retrieved: April 5, 2010. ^ "Beatlelinks: The Greatest Britons of All Times." news.bbc.co.uk. Retrieved: December 29, 2009. ^ "Alexander Graham Bell (1847–1922)." Scottish Science Hall of Fame. Retrieved: April 5, 2010. ^ "Honorary Degree Recipients." Provost.gallaudet.edu. Retrieved: July 28, 2010. ^ "Overview , Graduations, Registry." Registry.ed.ac.uk, July 12, 2010. Retrieved: July 28, 2010. ^ "Dartmouth graduates." The New York Times. Retrieved: July 30, 2009. Bell, Alexander Graham. The Question of Sign-Language and The Utility of Signs in the Instruction of the Deaf—Two papers. Washington, D.C.: Sanders Printing Office, 1898. Wilson, James Grant; Fiske, John, eds. (1900). "Bell, Alexander Graham" . Appletons' Cyclopædia of American Biography. New York: D. Appleton.